« Write me a review! I was recently introduced to the image below and thought it was something I should share. Given my interest in pterosaurs and palaeoart I was rather surpised by it as I was completely unaware of its existence. That is is by a British artist with a major influence on early depicitons of fossil animals only added to my surpise that it had passed me by. Perhaps it is well known and I’ve simply managed to miss it, but I rather supect it may not be common knowledge at all since it was apparently not created for a palaeontological audience. The picture in question was made in 1783 by Benjamin Waterhouse Hawkins, he of the Crystal Palace dinosaurs fame. Hawkins designed these, and many other sculptures, and produced all manner of artworks that were used to show off dinosaurs and other ancient beasts. 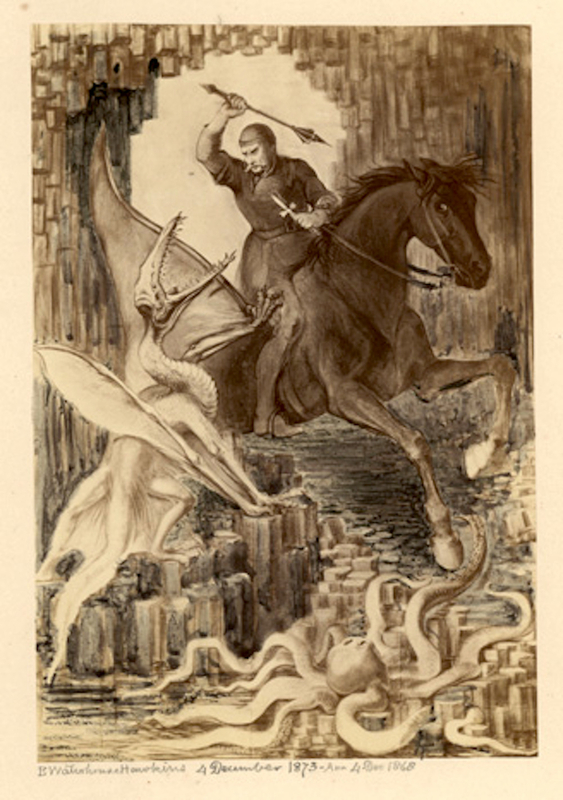 In this case this wasn’t ever a palaeoart pic as such but really an illustration of the legend of St George and the dragon only with the latter having a very prehistoric bent. Those who know the Crystal Palace animals will reconise the pictured ‘pterodactyl’ as being a very close representative of the pterosaurs that sit on a rock above the dinosaurs. This animal is rather larger than these and would be big for a pterosaur known at the time, (and huge for a Pterodactylus) but despite some oddities (the back of the head in particular, and the very long tails) is very clearly pterosaurian. Given the number of prominent scientists of the age who are at some level creationists (including Richard Owen, Hawkins’ employer on the Crystal Palace sculptures) it is tempting to assume that this was an influence in illustrating such a religious figure with something that’s perhaps less a fictional dragon and more real, if extinct, creature. Is there an attempt here to give credence to the legend by suggesting the dragon was real, if a little out of time? I can’t help suspect so, though I don’t know Hawkins’ intent, perhaps it was simply a case of a nice bit of inspiration for him to be able to use one set of ideas on a second project. Either way, for me it’s a rather interesting piece of early pterosaur illustration and one that deserves to be better known. Looked it up. I thought it wasn’t the case based on a letter he wrote while designing the defunct New York Paleozoic Museum, but apparently Hawkins did literally believe that the Dragon of St. George and other fantastic creatures were encounters between humans and extinct animals. He even apparently gave a talk claiming that pterosaurs and plesiosaurs were the dragons and sea serpents of myth. The picture appears to have been intended to be taken literally based on this reference. I had heard that he was a literal believer and was implying these were late surviviors / never extinct etc. but hadn’t seen any reference or support for that. Thanks for the link. This is fascinating but the link is broken. Could you repost a more accessible link? Thanks!